There was once a little boy called Joey, who played a lot of sport. 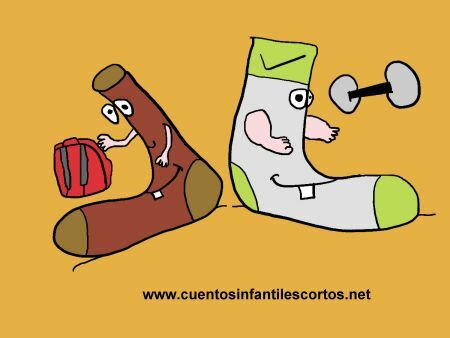 Every day he went through three pairs of socks – all of them sports socks. He wore sports socks when he went to play basketball and sports socks when he went to play football. All that was normal. But Joey also wore sports socks when he went to school, and when he went to visit his grandparents, and in fact any time he left the house. But in his drawers there were all sorts of other socks, including ordinary socks. Joey quickly recognised the sock – it was one his mother had given him two years ago now. So the ordinary sock asked Joey to give them a chance. Joey thought that as he’d taken the trouble to come all the way out of the draw and talk to him, he should give the ordinary socks an opportunity to be worn. That night, the ordinary socks decided that the next day should be the most special day of Joey’s life, and that they should make him feel more comfortable than ever before. Their plan was to be more comfortable than sports socks, so they decided to put little rubber balls on the bottom of each sock so that with every step Joey would feel as if he were getting a massage. The next day, Joey got up for school and was as good as his word. He put on his ordinary socks and a pair of shoes. As he walked, he noticed how comfortable it was; he was so light on his feet it almost felt like he was flying. For Joey, it was the most comfortable walk to school he had ever had. From then on, he learned that everyone deserves a second chance, and that he would have to vary his wardrobe more.